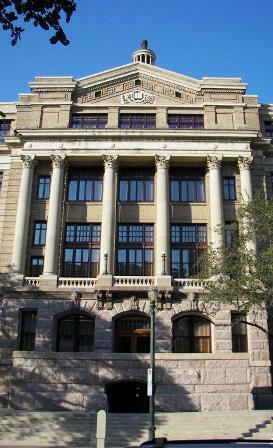 Harris County Courthouse Houston Texas. Harrisburg County was formed in December of 1836, the same year that brothers Augustus C. and John K. Allen founded the city of Houston. The county seat was moved to Houston from Harrisburg, a small settlement east of Houston at the junction of the Bray and Buffalo Bayous, in 1837. In 1839, the name of the county was changed to Harris County in honor of early settler and the founder of Harrisburg, John Richardson Harris. The first five Harris County courthouses all occupied the same plot of land, set aside by the Allen brothers specifically for the courthouse. The first, built in 1838, was a two-story pine log building built by Maurice I. Birdsall, who also built a log jail on the northeast corner of the courthouse square. This courthouse was enlarged in 1841, but by 1844 its deterioration led to its sale at auction. Claiming the building as their personal property, the Allen brothers had it moved across the street for a short time for use as a post office. The building was moved yet again to Washington Road for use as a store and a home. From 1844 until 1851, court sessions were held in various hotels around the square. 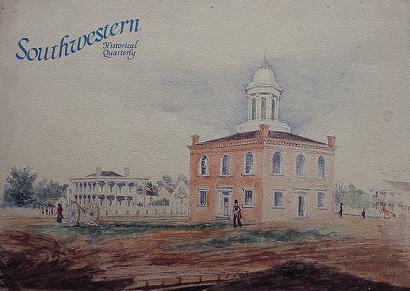 In October of 1851, a second courthouse was completed and dedicated. Costing $15,000 and designed by F.J. Rothaas, it was a two-story brick building with central entrances on each side and a central domed cupola. Unfortunately, the walls and foundation developed cracks and the building had to be demolished in 1860. 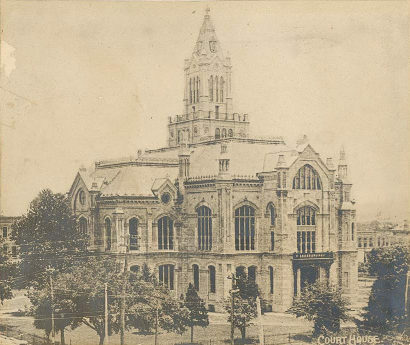 The county�s third courthouse was to be built that year. With an estimated cost of $25,000 and design by N. DeChaumes, the courthouse was intended to be a two-story Greek Revival style building with Classical style porticoes and a large central cupola, but by the start of the Civil War, only the walls, floors and roof had been completed. During the war, the courthouse was used as a cartridge factory, officer�s quarters and a hospital for Confederate soldiers and the basement was used to house Union prisoners. This building also deteriorated rapidly and was demolished in 1869. * Its bricks were sold and used to construct the Annunciation Roman Catholic Church on Texas Avenue. The courthouse square was used as a municipal park until the construction of a fourth courthouse began in 1883 and was completed by 1884. 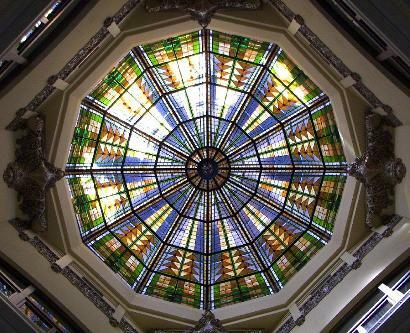 Designed by Galveston architect Edward J. Duhamel, who had won a contest in 1878 to design Houston�s new City Hall and Market House, the county�s fourth courthouse was a grand three-story Victorian style building with projecting bays on a cruciform floor plan and a central spire. The cost of the building was $100,000. Sometime later, the tower was removed and by the early twentieth century the building was condemned due to its deterioration. 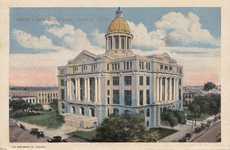 Plans to build a fifth courthouse were underway in 1907. 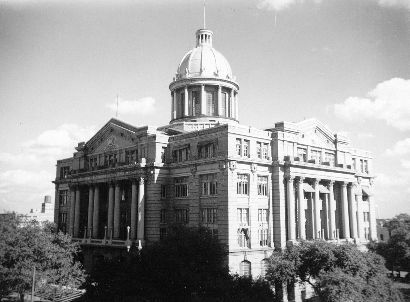 Construction began in 1909 and was completed by late 1910, but the courthouse was not dedicated until March 2, 1911 in observance of the 75th anniversary of Texas independence. The courthouse was designed by Charles Erwin Barglebaugh of the Dallas architectural firm of Lang and Witchell, who had designed courthouses for Howard, Nacogdoches, Scurry, Cooke and Johnson counties around the same time. 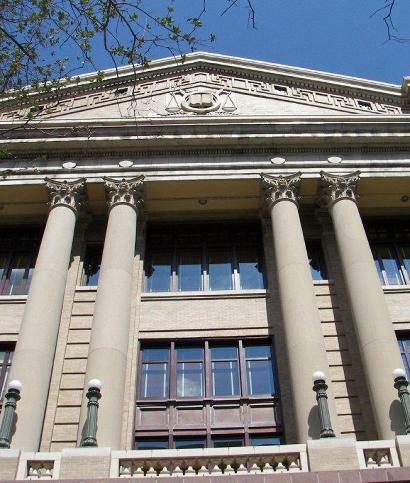 The $500,000 Beaux-Arts style (also referred to as Neo-Classical Revival,) six-story courthouse was built primarily of rough cut pink Texas granite and light brown St. Louis pressed brick with terra-cotta, limestone and masonry ornamentation. Each side consisted of raised, projecting porticoes with Corinthian columns and the building was crowned with a central dome with supporting columns around the drum and a ring of eagles around the base of the dome. The top had a Doric lantern with a cap that looked like a chess pawn. The lantern cap was removed not long afterwards. A defeated bond issue for a new courthouse in 1938 saved the 1910 building from demolition. The county quickly ran out of space in this courthouse and a new modern style courthouse was built to the east across San Jacinto Street in 1952. 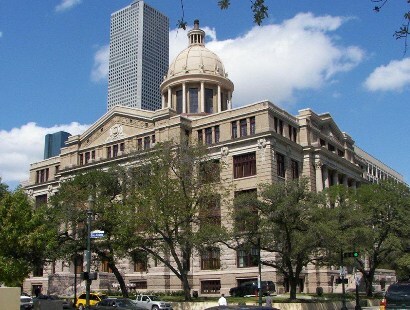 Built of marble and granite, the 1952 courthouse was designed by architects George W. Rustay and Joseph Finger, who designed Houston�s 1938-39 City Hall. Finger died during the construction of the new courthouse. 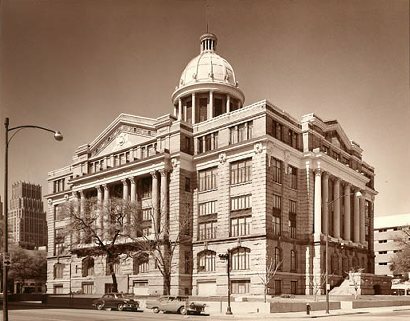 The firm of Finger and Rustay also remodeled the 1910 courthouse in 1954 which became the Harris County Civil Courts Building upon its completion in 1956. The interior plaster ornamentation, marble walls and dome skylight were ripped out or covered up and the rotunda was sealed to add more office space on each floor as were the courtroom balconies. The wood frame windows were replaced with metal ones and the exterior stairs on the east and west side were also demolished, switching the entrances from the second to the first floor. 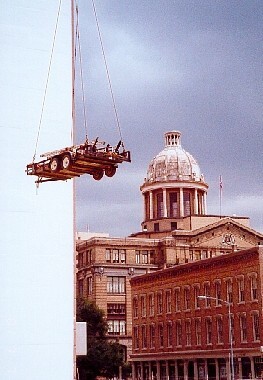 In 2003, plans began for the restoration of the 1910 courthouse. The building was closed in 2006 and construction began in 2009. 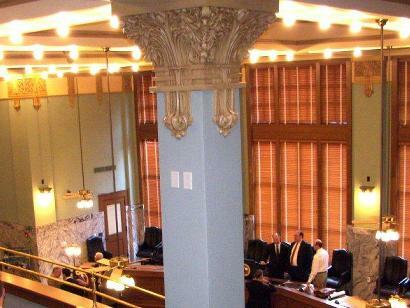 The restoration of the exterior and public areas on the interior to their 1910 condition was completed in 2011. 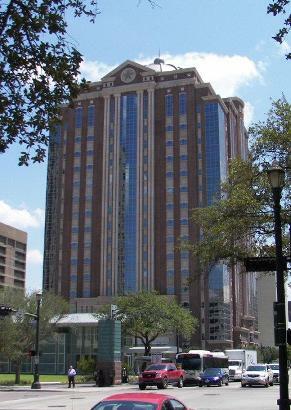 The growing needs of the Harris County court system led to the building of the Family Law Center in 1969, north of the 1910 courthouse across Congress Street, and the County Administration Building in 1979, west of the 1910 courthouse across Fannin Street. 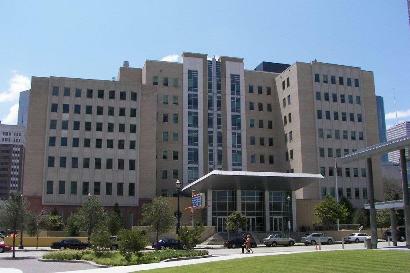 More recently, a twenty story Criminal Justice Center was built, dedicated in 1999, and a seventeen story Civil Courthouse was built, dedicated in 2006. 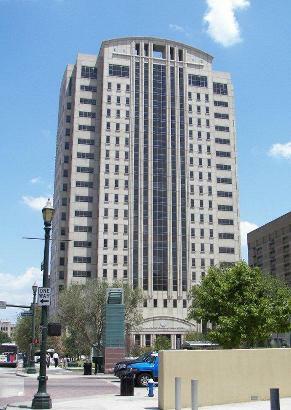 When the new Civil Courthouse was opened, the 1952 courthouse was rededicated as the Harris County Juvenile Justice Center. 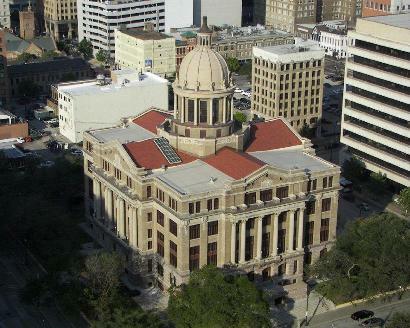 In July of 2011, the Jury Assembly Center was opened, north across Congress Street from the 1952 courthouse. The Jury Assembly Center�s above ground entrance leads to underground assembly rooms that connect to a tunnel system that links all of the other court buildings in the area. Sources: Texas Historical Commission County Atlas at http://atlas.thc.state.tx.us/shell-desig.htm, National Register of Historic Places and the Harris County Historical Commission at http://www.historicalcommission.hctx.net. County history and biographical information from the Handbook of Texas Online. 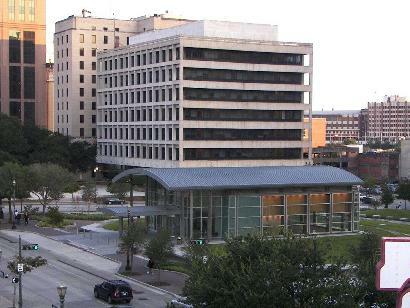 The Civil Courthouse in 2006.
the Family Law Center behind it. 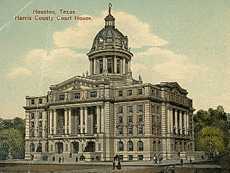 One postcard caption for the 1910 building states: "The Largest Courthouse in the State of Texas." The figure that once stood atop the building disappeared sometime before 1939. 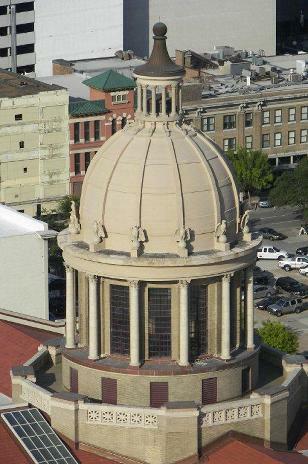 On August 23, 2011, I was pleased to be able to attend to rededication ceremony of the 1910 Harris County courthouse. This was the culmination of what began in March of 2003 when the master preservation plan was presented to the Texas Historical Commission. 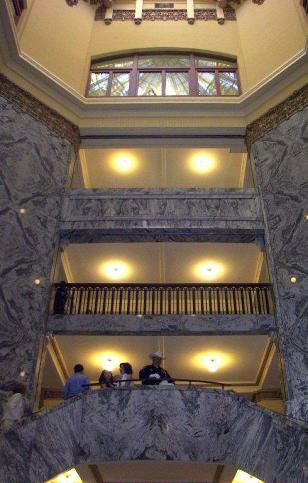 The cost, nearly $65 million with $5.5 million from the Texas Historical Commission, seemed exorbitant to many and the effort to restore the public parts of the interior to its 1910 condition was going to be difficult because the inside was so completely changed during the 1950s remodeling. Marble walls and plaster ornamentation were ripped out and covered up, the rotunda was sealed off and the glass skylight at the bottom of the dome was removed. On the exterior, the dome�s lantern cap went missing and the massive staircases on the east and west sides that led up to a second story entrance were removed and the entrances were moved to the first floor. 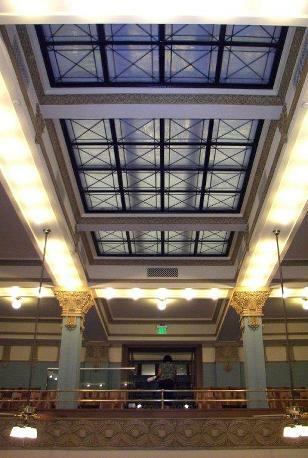 To restore the interior, historic preservationists had to rely on remnants found from the original building, historic photographs, of which there were few, recollections of county residents who worked or visited the courthouse before the remodeling and examples of the original architects other work for reference. The 1910 courthouse closed in 2006 and the actual construction phase began in February of 2009. The result of their efforts is nothing short of miraculous which I am unable to fully convey in these photos. It is something that needs to be seen in person. During my visit, I received a pamphlet called �A Self-Guided Tour of the Harris County 1910 Courthouse.� Most of the information in the photo captions come from this pamphlet. 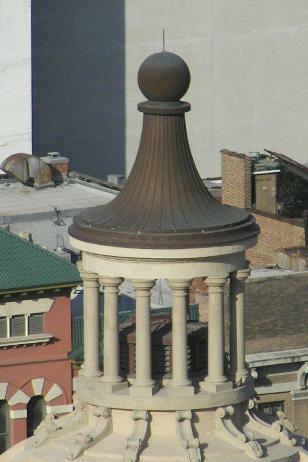 "The courthouse dome seen from the 20th floor of the Criminal Justice Building. The exact color of the roof's red clay tile was not known until photos of them surfaced on the internet in 1992." 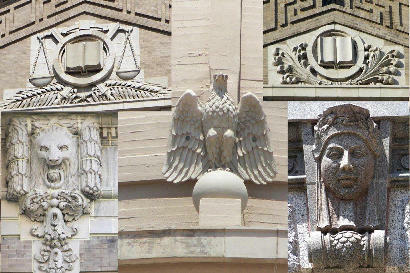 A collage of the building's exterior details.